Today is the first day of July and I know that usually I posted the nail calendar. So I decided, to keep up with the "tradition" so to say, to scan parts of the nail mags I have and post some Japanese nail art with tutorials. For July I chose two looks from the summer 2011 issue of Nail Venus. Since 4th of July is approaching I went for two looks inspired from America (according to the magazine at least). The first one is a Splatter Peacock nail art look. According to the magazine splatter peacock gives the sense of graffiti art. This type of nail art gives the feeling of street style. The point is that the colours must not overlap too much. Summer is all about mixing opposite colours for a flashy effect. So how do you achieve this look? First paint the nail with the white base colour properly with 2 coats. Then paint roughly the blue and pink to create graffitti effect. Using yellow and red, paint on top of what you see on step one making sure to leave a bit of white uncovered. Paint in a splatter style effect. Finally using a fine brush (or a toothpick) drag the colours gently to one direction to create a peacock effect. Finish off with top coat. The second look is a pastel colour look with golden studs. The main focus of this look is the colours. Using studs you can emphasize the curves and give the manicure an artistic look. First paint the nails with two coats of the black base colour. Wait for it to dry completelly. Starting from the base of the nail paint a curve from the side. Make sure you paint two coats so the black won't show. Then starting from the edge of the nail towards where the green ends make another curve (again 2 coats) and last put the studs. p.s. the winners of my giveaway will be announced sometime in the weekend. I am still verifying the entries. The pastel design is cute :) The gold studs look great on the blacK ! I love both =] I think the first design is going to take a heck load of practice to master! 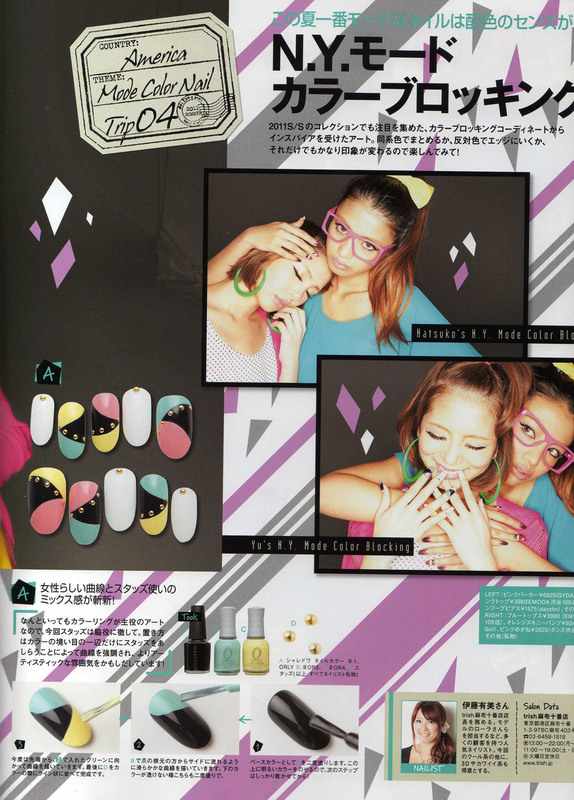 I love the japanese nail magazines! they are super talented and unique! 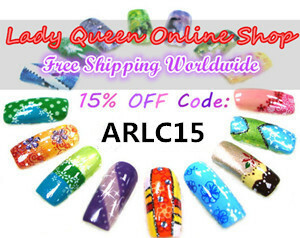 i love the 2nd design, what cool nails! Thx this is awesome I love seeing new ideas or techniques! these japanese magazines are great! I also have some!